Space is – as Star Trek puts it – the "final frontier". Commercial Space tourism is still a tiny market by anyone's standard, but it has definitely arrived – for those who can afford it. Driven to prove their superiority during the Cold War, as well as to gain a strategic advantage, the U.S.A. and the U.S.S.R. began the "Space Race" during the 1960s. In an astonishingly short time period, the U.S. Apollo program landed human beings on the moon and the Soviet Salyut program kept them in orbit for months at a time. Probes began to explore the solar system. Space seemed very close; at one point, tickets to the moon and to as-yet-non-existing Space stations were being sold. After the Space Race ended, a new sense of reality set in. The wild dreams of the 60s and 70s died, and humanity turned its attention Earthward again. Space travel beyond Earth's orbit became the exclusive domain of mankind's robotic explorers, and high-profile tragedies both reaching and returning from orbit provided sobering reminders of the risks of Space travel. By the end of the 20th Century, travel into Space was still exclusively the domain of governmental organizations. However, necessity changed the situation with the dawn of the 21st century. Desperate for funds, the Russian Space Agency began to sell seats on Soyuz launches. Businessman Dennis Tito became the first pay-to-fly Space tourist in April 2001, and since then a handful have followed in his footsteps. There are quite a few space-related places on the Earth itself. Baikonur, Kazakhstan. The rocket launch site of Sputnik 1 and Yuri Gagarin in Kazakhstan, and to this day the main Soyuz launch site. Long strictly off-limits, but now open to limited tourism. Huntsville, Alabama, USA. Astronaut training facilities and International Space Station design and construction. Cape Canaveral, Florida, USA. The site of Space Shuttle launches. Houston, Texas, USA. Mission Control for Space Shuttle and International Space Station activities. Kourou, French Guiana. The launch site for ESA's Ariana satellites. Mojave, California, USA. The first FAA-certified Spaceport and the home of Scaled Composites' private spaceflight program. Star City, Russia. Cosmonaut training facility northeast of Moscow. Tanegashima, Japan. Japan's main launch site. Free exhibits and tours, public viewpoints for launch days. While not actual Space travel, the weightlessness experienced in orbit can be duplicated (for durations of less than a minute at a time) with a calibrated parabolic aircraft flight, which alternates low g-forces at the heights of its arcs with high g-forces at the bottoms. The parabolic flights are notoriously nausea-inducing, leading to the nickname Vomit Comet, but commercial operators claim that their shorter flights (15 parabolas) are considerably gentler than lengthy research flights (40-80). 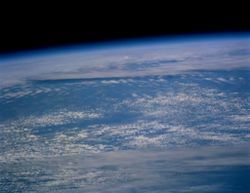 Flights at altitudes of less than 100 km do not qualify as true Space flight, but it is possible to see the curvature of the Earth from altitudes as (comparatively) low as 25 km. Sub-orbital flight is defined as flight at altitudes higher than 100km but at speeds insufficient to achieve orbit. While there are currently no operators offering sub-orbital flight, the privately funded and built SpaceShipOne in 2004 demonstrated that this is a possible market and the race is on to commercialize it. All that sub-orbital stuff is pretty nifty, but these days no one's really ready to accept that you were "in Space" until you've been in orbit around the Earth. There's no single altitude for this (it depends on your orbital velocity), but due to atmospheric drag it's only practical above 350 km. Commonly known as Low Earth Orbit, this is currently the exclusive domain of Russian Soyuz vessels, Chinese Shenzhou craft, and the International Space Station. This itinerary is likely the most expensive in the world. 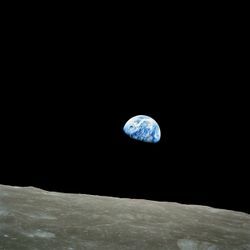 Human travel beyond low Earth orbit has not been done since the cancellation of the U.S. Apollo program in 1972. The only programs actively working to re-establish this capability are governmental in nature. However, in 2005, Space Adventures announced its intention to work with Russian Spacecraft manufacturer Energia and the Russian Space Agency to offer a roughly one-week two-passenger flight around the Moon (no orbit, no landing) in a booster-equipped Soyuz craft for $100 million per person, as early as 2010. This depends on a customer making a hefty deposit to get the project running, so don't wait for them to announce a flight date to get your name in. The sight of the Earth from Space is reputed to be incomparable. At altitudes above the thick atmosphere, the stars cease to "twinkle". Sunrise and sunset lose much of their multicolored glory, but take on greater intensity and speed at orbital and even suborbital velocities. 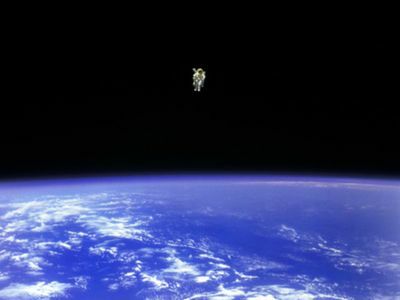 Freefall (often inaccurately called "zero gravity") is a phenomenon which, while not unique to Space travel, occurs only momentarily on Earth, such as in thrill rides or high-speed elevators. If you experience freefall and don't do some aerobatics and float around the craft, you've wasted a great deal of money. Take pictures – what else are you going to do all day? Don't forget the extra memory cards. Tourists traveling on otherwise scientific missions may be expected to contribute to them, participating in medical observations at the least. Extravehicular activity (EVA). Perhaps better known as spacewalking, this involves exiting the spacecraft to float around in space. This is now available as an option at Space Adventures, but there have been no takers yet: opting for this would cost $20 million extra, requires an extra month of training and has additional fitness qualifications. Space dive – Orbital Outfitters  is designing Sub-orbital Space Suit One, a suit to be worn by crew on sub-orbital flights and potentially suitable for "space diving" from 120,000 ft. Although Space food has come a long way in terms of taste and variety in recent decades, the quality and taste is still not up to standards of most connoisseurs of fine cuisine. Your transportation provider may offer some choice in the foods available, but you will ultimately be limited by their willingness to indulge you. While more mature technology has made it safer than it was in the 1960s, Space remains an inherently dangerous environment to put yourself in. Cosmic radiation, extreme temperatures, micrometeorites, engineering mistakes, high speeds, explosive fuels, the distance to terra firma, and the lack of atmosphere make any unplanned situation potentially life threatening. What goes up must come down – at least for now.